Hello Nerdy Chicks, Writers, Readers, and all around wonderful people. Have you been busy honing your craft since last summer? We hope so! The five of us have been doing just that. We’ve collectively been very busy this year! Some of the things we’ve dealt with have been stressful things, other things have been amazing. But altogether we’ve had too many things to juggle. So when we put our heads together, we found that we are unable to devote the kind of time it takes to pull off Kidlit Summer School this year. 😦 As you all probably know, it is a herculean effort to put all of the amazing pieces of this event together, almost a full time job. So, for 2017, we’re going to have to go on vacation. We know this is disappointing to many of you. It is to us, too. We love the webinars, the blog posts, and the exercises! Most of all we loved interacting with all of you and seeing many of you move forward in your craft and your careers. Kudos to you all! We want to say THANK YOU to everyone who has helped make KLSS awesome. We appreciate all of the authors and industry professionals who’ve contributed their time to share knowledge. And we thank all of you for your devotion to the program, and for your dedication not just to becoming writers, but to becoming the best writers you can be. Please stay subscribed to the blog. 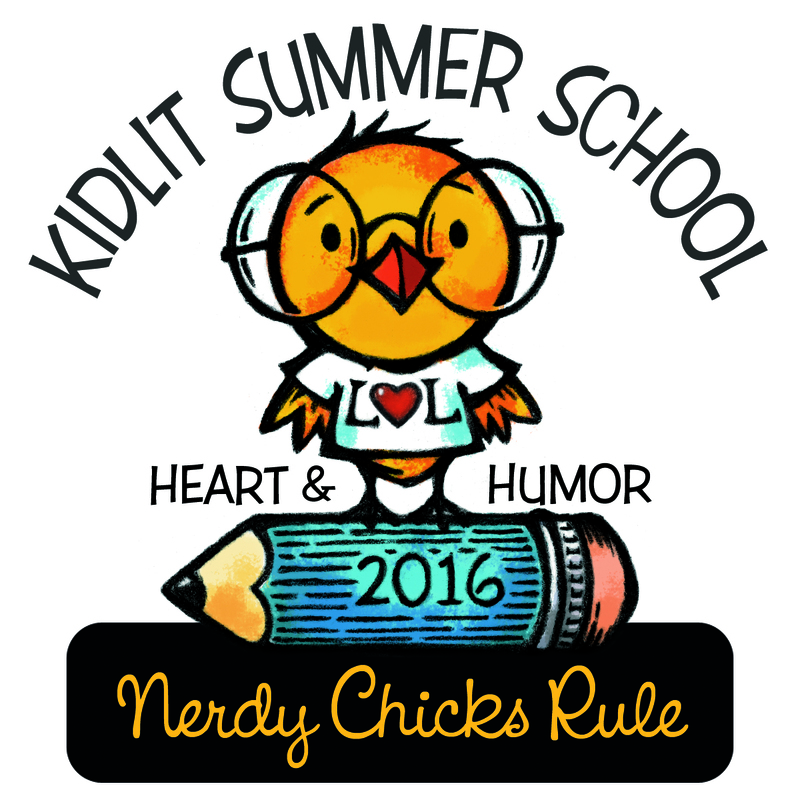 Announcements regarding Kidlit Summer School and other future events will be made here. You won’t want to miss anything good! We wish you all of the very best moving forward, and hope that you will keep us posted on your good news. In the meantime, we hope you’ll enjoy some vacation time too, and maybe pick up a good book to read in the sun! Three Cheers for the Final Giveaways! We Nerdy Chicks feel SO LUCKY to have the chance to work with a faculty full of authors who are smart, inspirational, and generous. All of our authors graciously shared their time and their knowledge. Some threw in a giveaway too. Let’s hear if for all of our author-teacher-bloggers! We want to take a moment in this final post to thank all of you summer schoolers too. Your enthusiasm and energy are amazing. So CHEERS to you too! Winners were selected from those who left comments on the individual posts using the Random Number Generator at Random.org. Winners, the author hosting the giveaway should contact you in a few days to arrange getting you your prize. 🙂 Congratulations! Thank you again to all of you who shared your time, energy and enthusiasm for writing with us this summer. We appreciate your comments! May your words carry you to wonderful places! In case you missed it, we announced other winners in this post HERE. So Hurricane Matthew blew by and some of us lost power, internet, and a whole lot of time to evacuating. And some of us (ahem) still do not have proper internet… so we’re announcing a few more prizes this week, and hoping that we can make up for lost time next week and award those awesome author prizes that went along with the posts! The winner of the #30mdare prize is Shelly Hawley-Yan! Congrats Shelly! Rebecca will be in touch with you soon to arrange the details about your critique! The winner of our July 7 prize is Lori Mozdzierz! Hooray Lori! You will receive a free Tote Bag and Notebook with the KLSS Logo designed by Bonnie Adamson. The winner of the Br ainstorming session with Kami and Sudipta is Lynn Marie! Yipeeee Lynn Marie! We’ll be in touch soon. The winner of the May 31 Tote Bag giveaway is Carol Baldwin!!!! Three Cheers for you, Carol! You’ll receive a free tote bag with the KLSS logo designed by Bonnie Adamson. Thank you ALL for the comments! Winners were selected using Random Number Generator at Random.org. More prize announcements coming soon! Stepping Toward those Awesome 2016 Prizes! 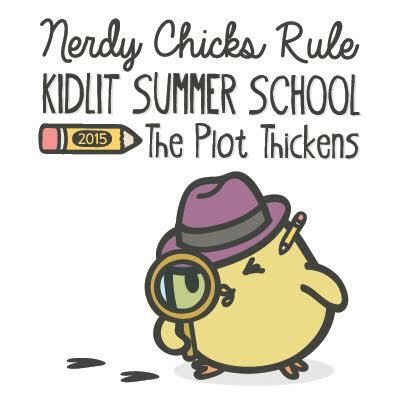 Hello Kidlit Summer Schoolers! We’re sorry for the delays on awarding the prizes. A bunch of us on the board have been hit with some of those “Life Happens” moments recently and so we’ve had to push back our usual announcement times. But we are rallying and organizing now, so we want to announce the first of those prizes! In our last post at the end of Kidlit Summer School, we asked everyone who had perfect attendance to leave a comment. Over a hundred of you left comments! Wow! Using the random number generator at Random.org a number was selected, and the person who left that comment is the winner of the prize. Congratulations Dayne Sislen! You won the Perfect Attendance Award for Kidlit Summer School 2016!!!! Now lets move forward on the #30mdare prize. For this prize, the amazing Rebecca Petruck is giving away a 20 page critique and follow up phone call to one writer drawn from all who participated in one of the #30mdares. If you participated in at least five dares, please fill out this very very short form so we can award that prize. You have a whole week to fill out the form, so please do it before midnight on October 9! The winner will be announced the week of October 10. The time to enter your name on the form is over! We’ll be announcing the winner soon! What about the other awesome prizes? We are gathering data, drawing names, and compiling lists! We will start announcing the winners of those prizes the week of October 10 too. 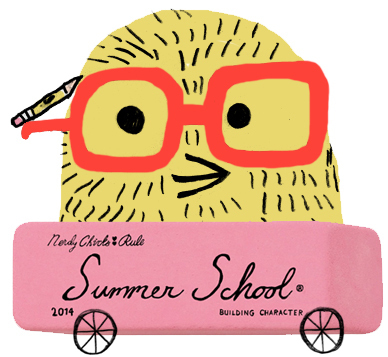 Thank you all for participating in Kidlit Summer School! Keep Writing! Sometimes I have what I think is a great idea for a story. I plot it out, polish the text, start thumbnailing scenes and begin working on character design. And then I hit a wall. Many of the elements are there, but the story just won’t come to life. This happens most often when there’s something in the way of the characters. Character = engagement = heart. When I haven’t fully engaged with my characters, there’s no heart and the project flatlines. In that case, the task is to give the characters some breathing room. Maybe the plot has taken over, or there’s too much detail choking the story—or maybe I simply haven’t given the characters enough to do. For a long time, I didn’t know who the main character was in this story. I didn’t *care* who the main character was. A fellow who has accumulated enough points to win the big prize at the rodeo, doesn’t. Misunderstandings ensue, plus slapstick humor and a surprise at the end. I liked it. I really, really liked it. But the story wasn’t breathing on its own. A critique partner read the manuscript to her daughter. She reported that the daughter was sad when the fellow at the beginning didn’t win the trophy. Sad??? This was only a minor plot point! What about the funny stuff and the twisty ending? What did it mean? Find your star player and make it *all* about him. Read your manuscript to an actual child. I thought I had this one nailed—a classic underdog-saves-the-day story with heart built right into the concept. Yay! But was saving the day enough? What if readers didn’t care about my little bumbling bee from the start? I was also having a lot of trouble coming up with a visual identity for her main rival. Worse, this seemed to be the main character’s only story. I know you’re not supposed to think in terms of sequels, but I had a character I liked who was totally boxed in by a dead-end plot. The Miss Marple Trick. Agatha Christie’s famous sleuth solves mysteries by observing behavior she can relate to that of inhabitants of her tiny village. One day while trying for the umpteenth time to come up with a sketch for my main character’s nemesis, I suddenly thought of two girls I had known in high school. One was better at *everything* that ensures popularity in that environment. The other was not so much an underdog as simply and thoroughly eclipsed by her friend. Eureka! Once I understood the dynamics the story became more about the relationship than saving the day, and future story possibilities opened up. Read vintage British murder mysteries. For this story, I did oodles of research to make sure the setting was authentic, accumulating notes upon notes about jungle habitats. I had a hook and a decent text and even some quirky character traits for the main character. But the obsession with the setting and the research had used up the energy that should have gone to showcasing the characters. My quirky crocodile didn’t have enough to do and came off as merely part of the scenery. Pure serendipity. In organizing a list of portfolio pieces by project, this one happened to be followed by a wordless story that had its own problems. How about a mashup? What if the protagonist in the wordless story showed up in the jungle? Bingo! The crocodile leapt at the chance to reveal himself as a method actor, uncovering motivations I had not been aware of. The text hasn’t changed, but now there’s a much richer subtext playing out in the illustrations, and the secondary characters have gotten into the act as well. Energize your characters with something totally unexpected. Have more than one idea in your portfolio. If *your* stories lack heart due to characters that are hidden in plain sight, boxed in by the plot, or smothered by the scenery, check out the download for exercises that will help you find the right treatment. Meanwhile, the stories above are all off life-support and should be up and around soon. Stay tuned! 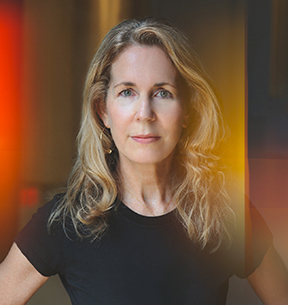 Bonnie Adamson is the illustrator of Bedtime Monster and the “I Wish” series of picture books for Raven Tree Press, as well as Rutabaga Boo!, written by the lovely and talented Sudipta Bardhan-Quallen and due in Spring 2017 from Atheneum. Visit Bonnie at www.bonnieadamson.com. If you are registered for Kidlit Summer School, you can download a worksheet of Bonnie’s writing exercise at our Exercise Book. This is a password-protected area—only members allowed! Please check your email for the password. GIVEAWAY! Bonnie is kindly giving away a Kidlit Summer School tote bag, featuring her fabulous design. For a chance to win, please leave a comment below. Don’t miss your chance to get perfect attendance! Leave a comment on this post within the first 24 hours. Moderators have to approve first-time commenters, so your comment may not show up immediately. And it’s going to tell you, the writer, what to do. Listening to your main character’s heart—is going to tell you what to write. But how do you listen to a fictional heart? Partway through writing Shining Sea I realized that the voice of my main character, 17-year-old budding singer-songwriter Arion Rush was becoming harder to hear. Her heartbeat was growing faint. Soon I began to understand, it was because I didn’t know her heart. Whenever there was a ‘musical moment’ in the story, Arion explored her feelings through songwriting, and her lyrics definitely showed what was in her heart. But everywhere else in the novel, her feelings, her wants, her needs—were hidden. I decided I should speak to her. But when I tried to interview Arion the first time, I didn’t get very far. Me: Hey Arion, how are you? And, where are you? Arion: I’m in my room at the lighthouse. Me: Cool. So . . . you probably know, I’m having a little trouble figuring out what’s up with you. Arion: Yeah, I know. I also know you want me to be nicer than I really am. Me: Okaaay . . . How about I ask you a few questions? Arion: Sure. Doesn’t mean I’ll answer. Me: That’s . . . fine. Let’s start with basics. What’s your favorite color? Arion: Red. That’s the only thing you got right about me. Me: Huh. Well . . . that’s something. How do you like Maine? Arion: I love Maine. I feel like, I belong in the woods. There’s a certain kind of wildness here. It makes me—I can’t believe you just stopped to fix a typo, are you even listening? Most of us take listening for granted. We believe we’re good listeners, and that everyone knows how to listen. But many people aren’t accustomed to listening on a deep level, and that’s very often where characters speak to us. In preparation for a second interview, I practiced specific meditation exercises that encouraged me to listen to my body, and focus awareness on my breath and emotional flow. The next time I interviewed Arion, I was much more prepared to listen. I heard about Arion’s relationship with her mother, and learned it was a source of pain. I found out Arion experienced anxiety due to her sister’s accident, but also that her sister had treated Arion badly in the past. As a result, Arion had closed her heart off to others, including me. She worked on her songs alone, and at the start of Shining Sea, she hadn’t sung for many people. But by the end of the book, Arion is well on her way to becoming a performer, and more. I’m convinced her transformation occurred not only because I started listening on a deeper level, but because I’d spent some time with my own heart. Me: I’d like to talk a little more about your mom. Arion: Look at her canvases. Me: Um . . .
Me: Slow down. Wears on you? Isn’t that kind of an adult thing? Arion: I’ve been taking care of myself for a while, in case you haven’t noticed. Dad’s got his boats, Mom’s got her art, and Lilah—even before the accident, Lilah was mom’s favorite. She sees Lilah’s wildness, that’s part of it. She thinks it’s like her own. She doesn’t get my wildness. Hey, how about a cup of coffee? Arion: I need caffeine. Arion RUSH—hello? Arion: I’m becoming an artist. Me: (Stunned) I’m impressed you know that. Me: Every adolescent feels that way. Every person feels that way. Arion: Different, like—there’s something wrong with them? Me: Well there is something wrong with you. You’re not afraid of Bo, and he’s a Siren. Arion: That makes him wild. I am too—inside. I’m wild, in my heart. Can you write that? If you are registered for Kidlit Summer School, you can download a worksheet of Mimi’s writing exercise at our Exercise Book. This is a password-protected area—only members allowed! Please check your email for the password. GIVEAWAY! 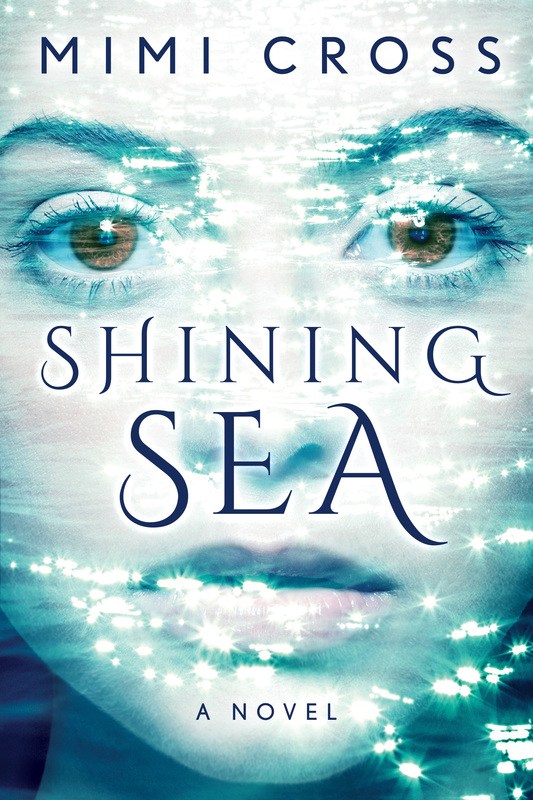 Mimi is kindly giving away a copy of Shining Sea, the paperback or MP3 audiobook version. Winner’s choice! For a chance to win, please leave a comment below. It was a bit of a revelation. I really love and admire those almost songlike 100-word-or-less manuscripts that are super popular right now. But that’s not what I do well. I do funny. And once I leaned in to that, it became much easier and more fun to write. It should have been obvious. I’ve worked on late night comedy shows for almost two decades—not as a writer but as a designer. But that sensibility seeps into your consciousness. You tend to look at things a little sideways to find the funny in it. So given my skewed view of the world, I try to write things that make me laugh and hope that kids will laugh along with me. For me, it’s virtually guaranteed because, as my wife will tell you, I am essentially an 8-year-old boy. But I understand that funny isn’t easy. To that end I’ve been working for several months on a prototype of a machine that helps infuse comedy into a manuscript. 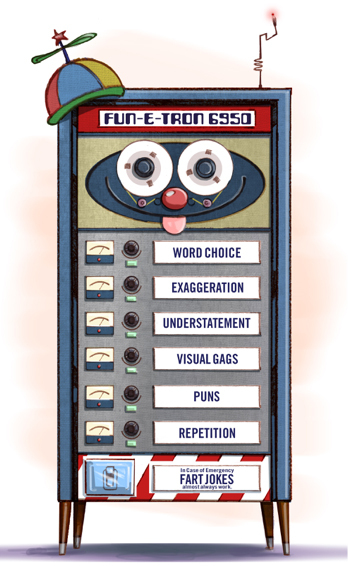 I call it the Fun-E-Tron 6950 and it gives you access to my favorite seven satire supplies. Certain words just sound funny. Like “persnickity”. I love that word. Ooh..or “bumfuzzle.” Why would anyone ever write “confuse” when they could write “bumfuzzle.” I would always rather write “blubber” than “cry”. I also like the word “squeegee” but you never see one in a picture book. It’s not real life—it’s picture books. When your 5-year-old character is having a hissy fit (more great words) and screams, have her blow the roof off the joint. Literally. The rules of physics don’t apply here. Don’t build a sorta tall sandcastle—build a tower that touches the clouds. Go big or go home. Obviously both of these will rely heavily on your best friend, The Illustrator, but it all starts in your script. It’s up to you to set up situations where “physical comedy” can take place. Someone somewhere wrote scripts for The Three Stooges. (I bet in real life, Moe was a pussycat.) And even though The Stooges were the ones that executed the comedy, a scenario was written down in a script for them to follow. Likewise, an illustrator can execute what you’ve initiated for them. The same goes for visual gags— large guys named “Tiny” for instance. Gets me every time. OMG, do I love puns. Jokes that play on the fact that different words sound the same are perfect for picture books. My son loves them too but he’d never admit it publicly. Once, in the market, I made a joke about nacho cheese being “not your cheese” (say it fast) and he laughed for hours. I love that moment when we’re reading together and we come across a pun. Sometimes I can actually see the wheels turning in his head until he gets it and lets out a loud guffaw (yet another great word.) Once he understands it, he feels like he’s in on the joke and that’s a great feeling. Be punny. Repeating similar scenarios throughout your book is a great way to infuse some humor. In comedy, there’s usually a rule of threes. Repeating a line or event three times can build a scenario where you can either meet expectations on that third go-round or defy expectations which can be hilarious. Another great use of repetition is the “callback” where an earlier phrase or event can be used as a punchline later in the book. A good callback is the best. Not much of an explanation needed here. Farts are funny to anyone less than eight years old or anyone with a Y chromosome. 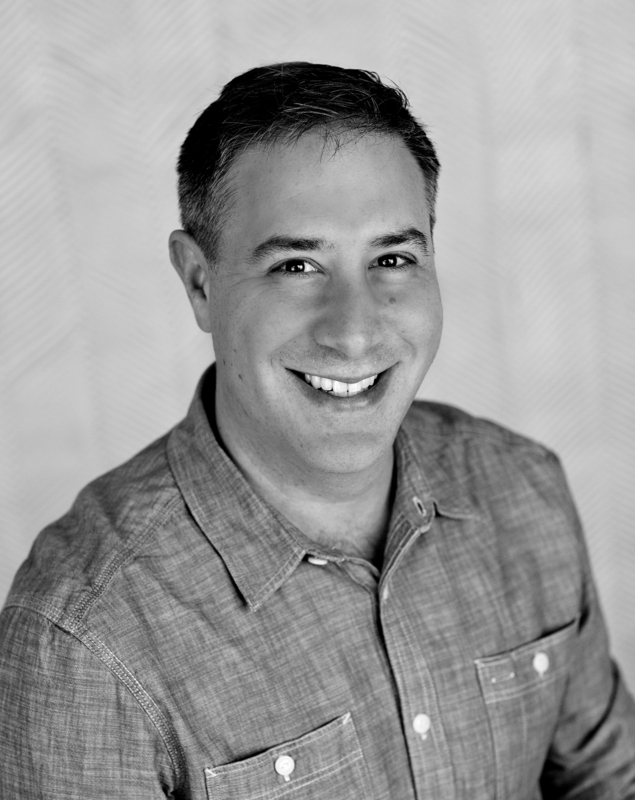 Jason Kirschner is a set designer for television with credits that include Late Night with Conan O’Brien and The Late Show with David Letterman. He’s also the author and illustrator of Mr. 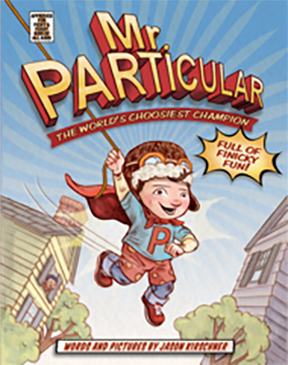 Particular: The World’s Choosiest Champion from Sterling which you can now find in bookstores everywhere. See more of Jason’s work at jasonkirschner.com. Follow him on Twitter by clicking HERE. If you are registered for Kidlit Summer School, you can download a worksheet of Jason’s writing exercise at our Exercise Book. This is a password-protected area—only members allowed! Please check your email for the password. GIVEAWAY! Jason is kindly giving away a copy of Mr Particular. For a chance to win, please leave a comment below. 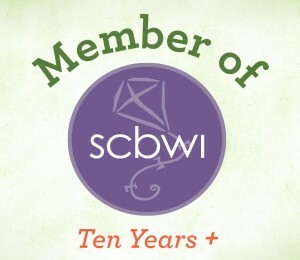 Grab our badge designed by the amazing Bonnie Adamson! Last year’s badge designed by the talented Joyce Wan. Our 2014 Badge designed by the amazing Zach OHora! Books by 2014 Summer School Faculty! 2015 Books coming soon.